How Mercedes engineers have made a four-cylinder sound this good, is beyond me. 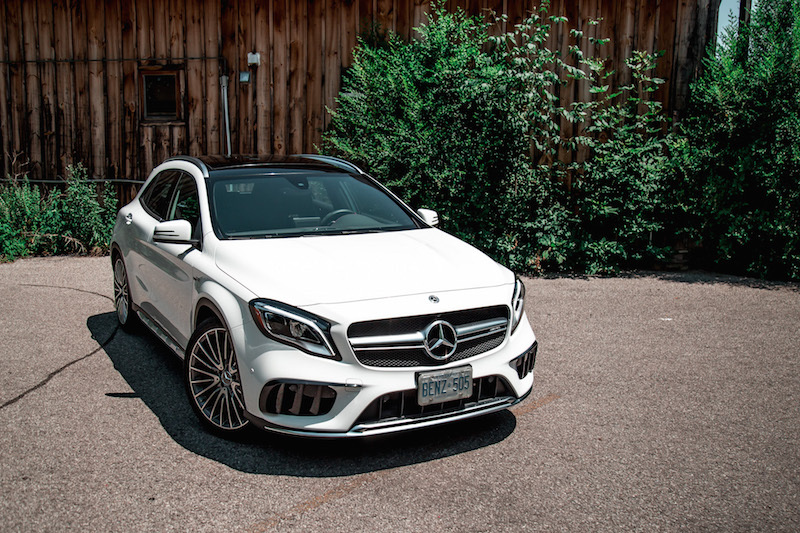 Whatever magical sorcery they have done to tune the vocal cords from this small displacement engine is worth the $52,300 price alone that this GLA 45 AMG commands, and then some. 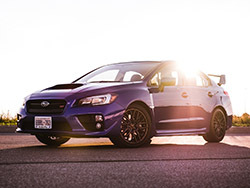 It snorts, it barks, it farts, and it howls - the perfect description for an infant but also the definition of Affalterbach’s hottest hatch. The GLA 45 I tested had the optional AMG Performance Exhaust, elevating the decibel count and the smiles per mile even further. 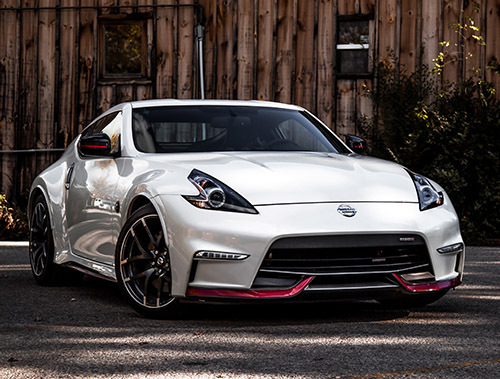 In additional, the active exhaust can be switched on and off via a dedicated button on the center console, so you’re not perceived as one of those neighbours on the block disturbing the peace. The last time a small hatch made me grin like this was the Fiat 500 Abarth, and that has an even smaller engine. 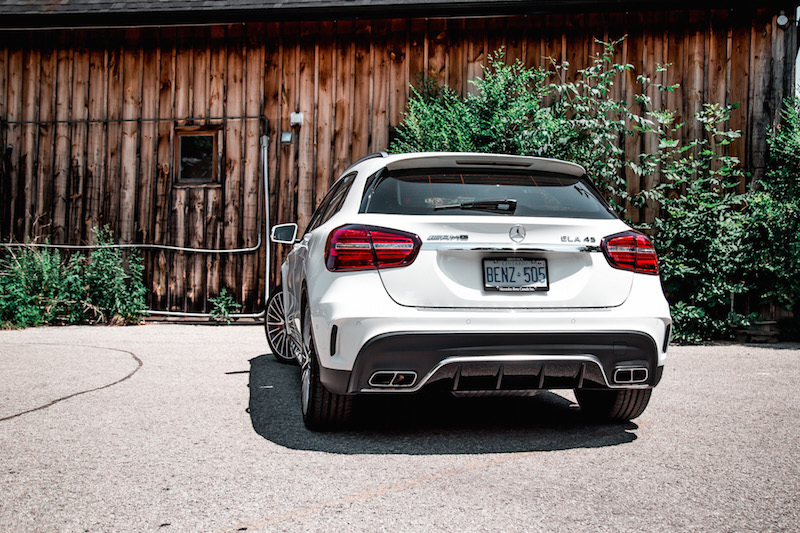 Have a listen to our Exhaust Notes video below to hear the GLA 45 for yourself. Don’t forget the tissue box. 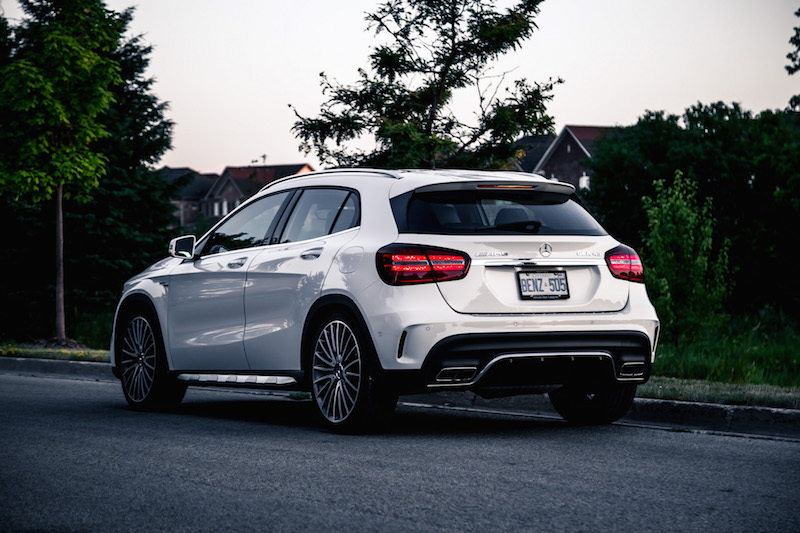 Exhaust aside, the GLA 45 enters the 2018 model year with a facelift so minor that you’d be hard pressed to notice the tweaked front bumper, grill, and newly designed 20-inch wheels. 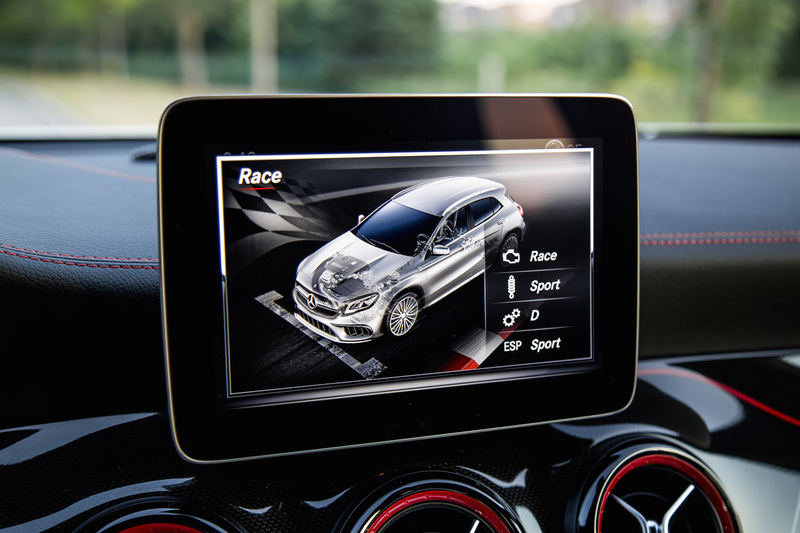 LED headlights, a leather dashboard, and a rear view camera now come standard, and there has been a reshuffling of stand-alone options. 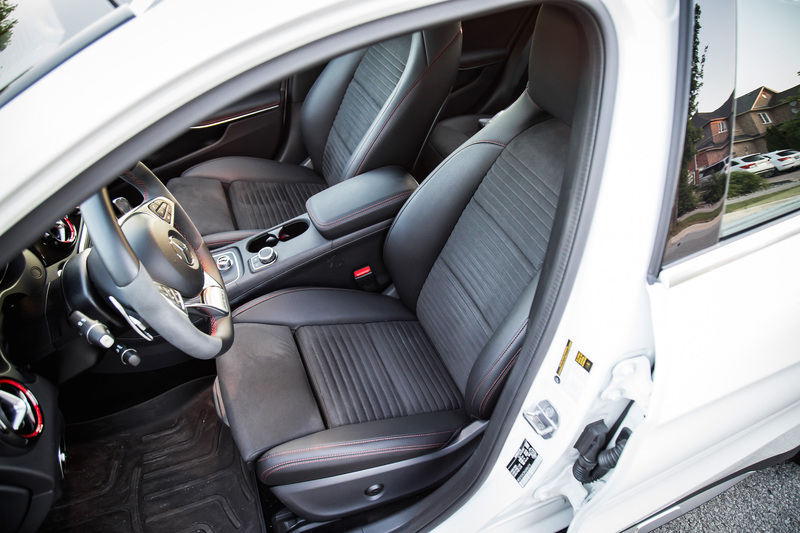 The interior gets beefed up with a new steering wheel and revised infotainment system. 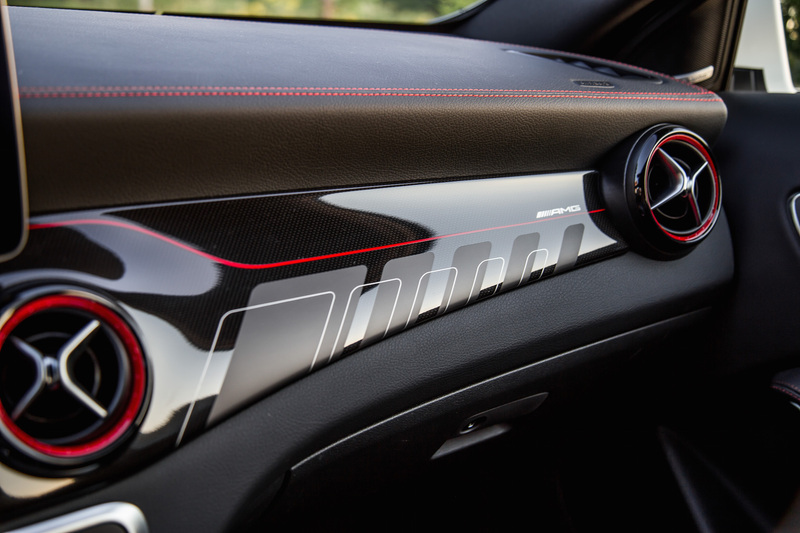 Red accents run rampant along the cabin with AMG graphics along the passenger side dash - to some it may be overkill but I’m sure dedicated Benz fans will adore every inch. The seats are still comfortable and well padded, and the seating position is excellent. I stand six-feet tall and even with the sunroof cutting away at some precious headroom, I fit perfectly if the seat is lowered right to the bottom. You can option the GLA with AMG Performance seats ($2,300) but I think these offer just the right balance of lumbar and thigh support. Long live the analog gauges but I can do without that tack-on 8.0-inch display screen, which looks horribly out of place. 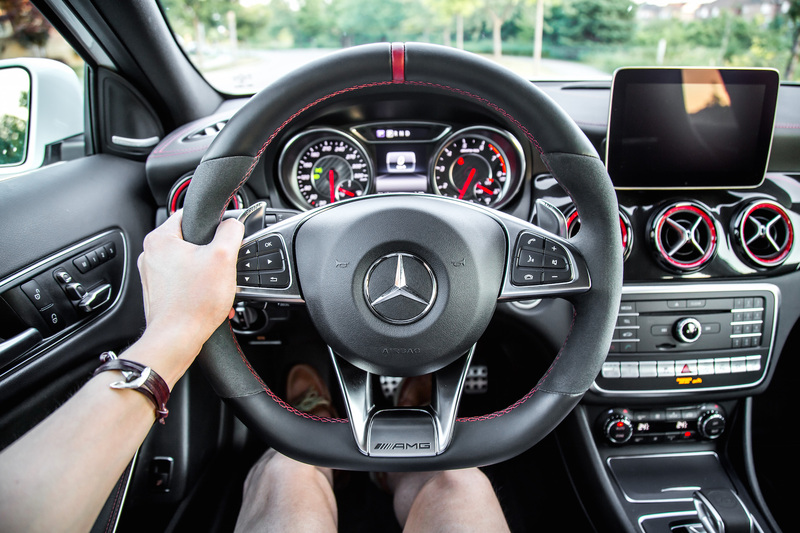 This non-touchscreen system isn’t the easiest to use either with a cumbersome left-right scrolling interface and the hindrance of a rotary dial that looks nearly identical to the rotary dial situated right above it that controls the driving modes instead. 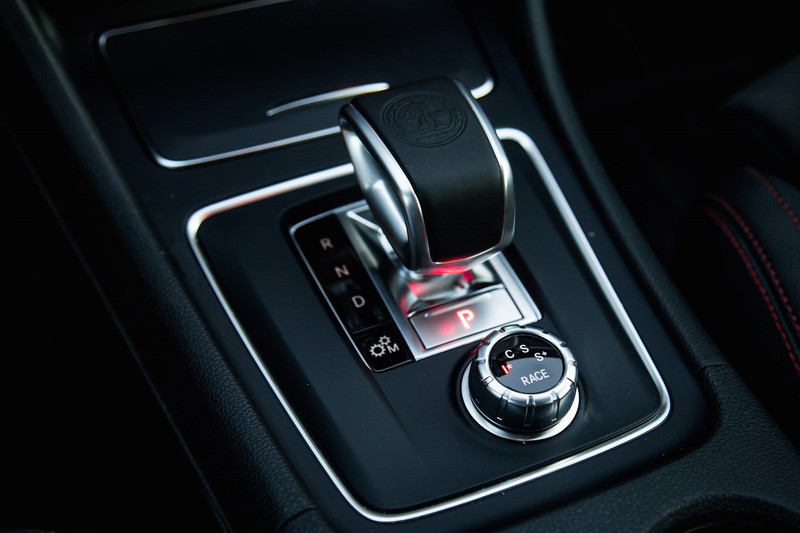 The button-intensive center stack is useful and offers a one-touch method to many driver commands, but annoyingly the number pad shortcuts always demand two digit inputs. Meaning if you want to go to the radio station you programmed to “1”, you actually have to input “0-1” to get there. 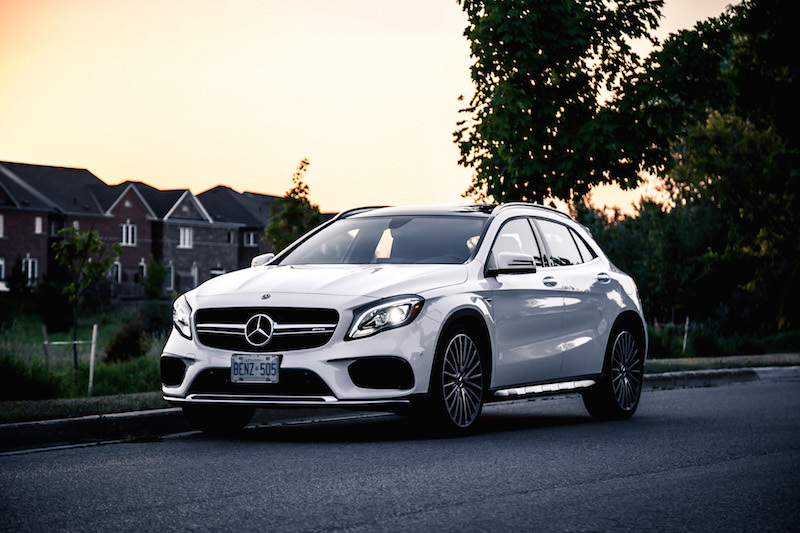 As an everyday driver, the GLA 45 wins points for its hatchback utility. Rear seat legroom isn’t terrible but it’s the trunk and the massive liftgate that colours me impressed. 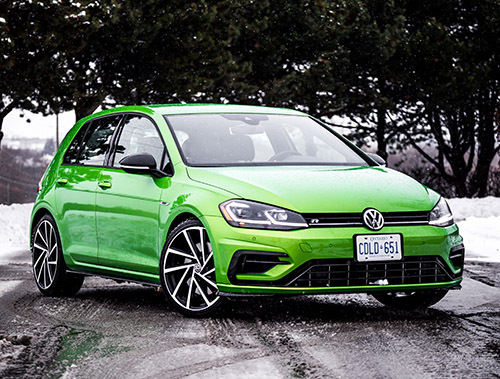 The cabin quarters may feel more cramped than the comparative Honda Civic Type R or even the Volkswagen Golf R, but it’s more than usable for a married couple. Adding a child or two to the mix may be stretching it and the seatbacks do not fold fully flat either. Still beats the CLA, though. 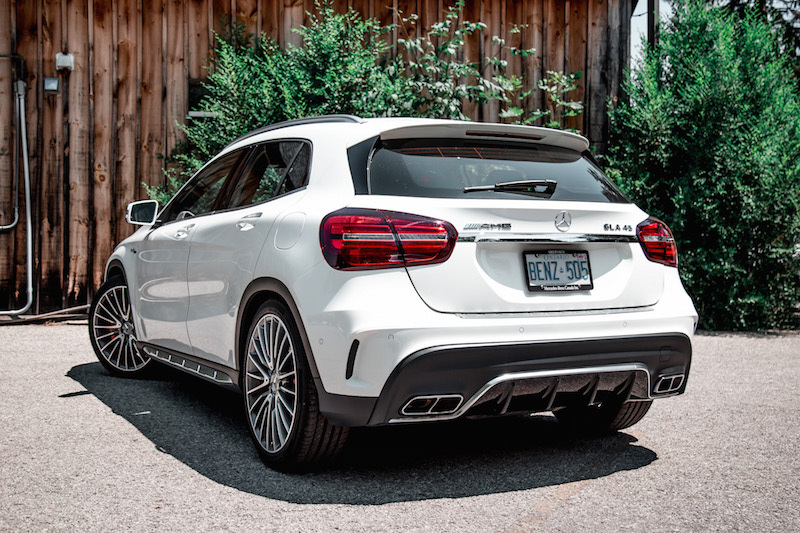 Our GLA example was not equipped with that juvenile rear spoiler for extra “downforce”, because your commute from Markham to Toronto really needs that. 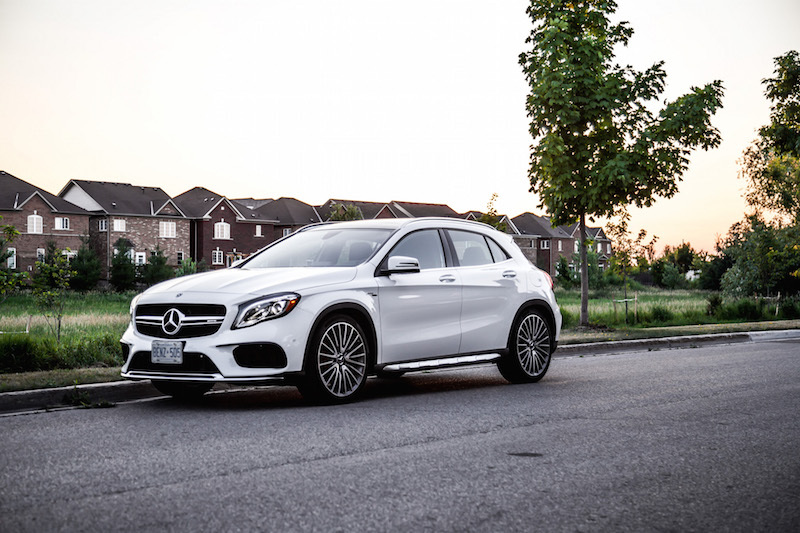 In fact, without it the GLA 45 looks eerily similar to the base GLA 250 without many clear giveaways, allowing it to anonymously blend into traffic. 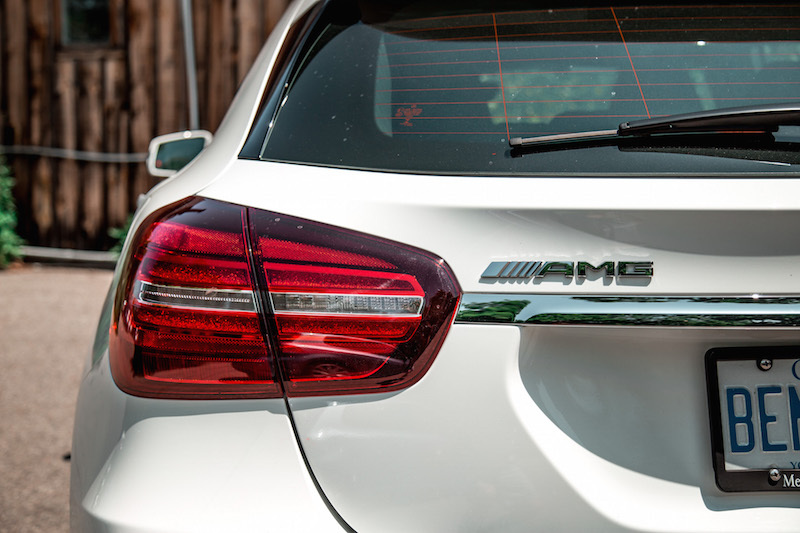 AMG specifics include the double lip front grill, quad exhausts, obvious badging, and a revised front and rear bumper, but these cues are hardly screaming in your face. Parked next to a Civic Type R, I’d even go so far as to call the GLA 45 a mature looking hatch. 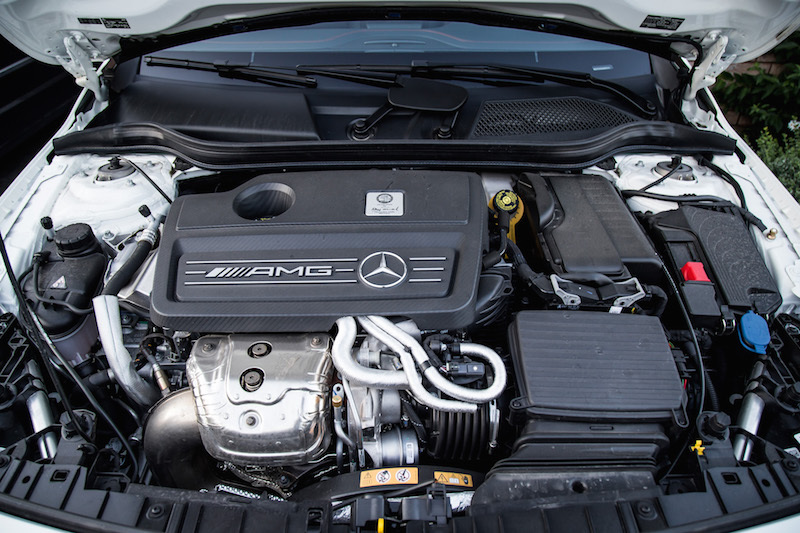 The star of the show and why you’re paying $50,000 for a small Mercedes is the engine, an entirely handmade 2.0-litre four-cylinder engine that now pushes out 375 hp and 350 lb-ft (versus 355 hp and 332 lb-ft from the outgoing model) through a 7-speed dual-clutch transmission. 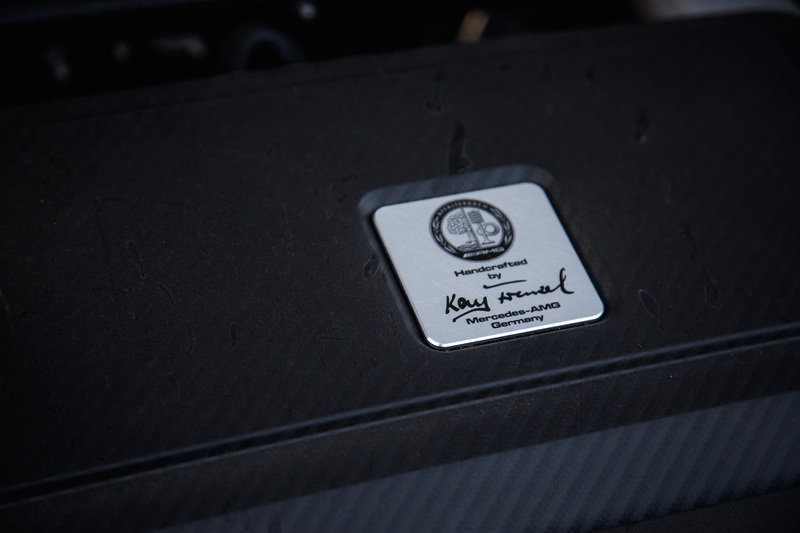 Those are numbers usually attributed to six-cylinder engines, and actually stands as highest output of any four-cylinder currently in production, again, magical sorcery courtesy of Affalterbach. The GLA sends this boatload of power to all four wheels via a 4MATIC all-wheel drive system that ranges delivery between full front-wheel drive or a 50/50 front-rear split. Off the line, the GLA 45 howls and slingshots forward with a thrust that will make you do a double take on the spec sheet. 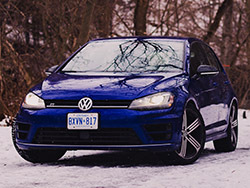 Four cylinders, only? 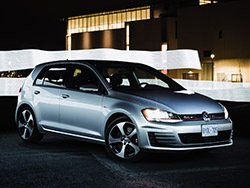 0-100 km/h comes in 4.4 seconds, enough to decimate any R badged Honda or Volkswagen. That’s even faster than the rear-wheel drive BMW M2. Good thing then, that the brakes are equally as potent and the steering as communicative. 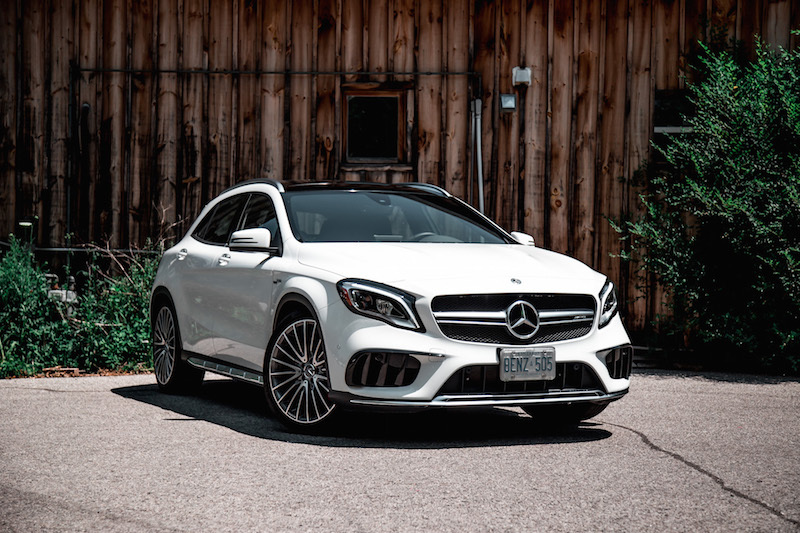 On an interesting note, the GLA 45 only weighs 5 kg more than the GLA 250, not surprisingly as both use the same engine and transmission but with slightly different tunes. 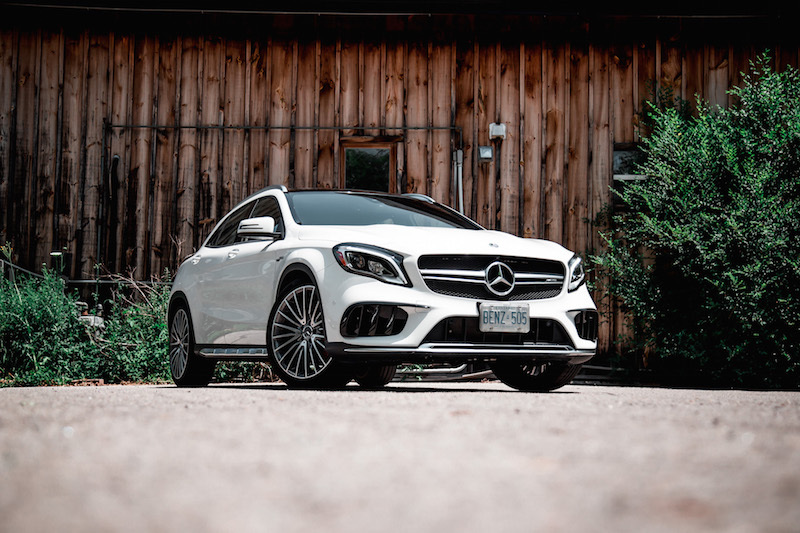 The suspension has been stiffened up to AMG proportions and is tolerable on smooth pavement but it won’t go appreciated in the arthritic population. 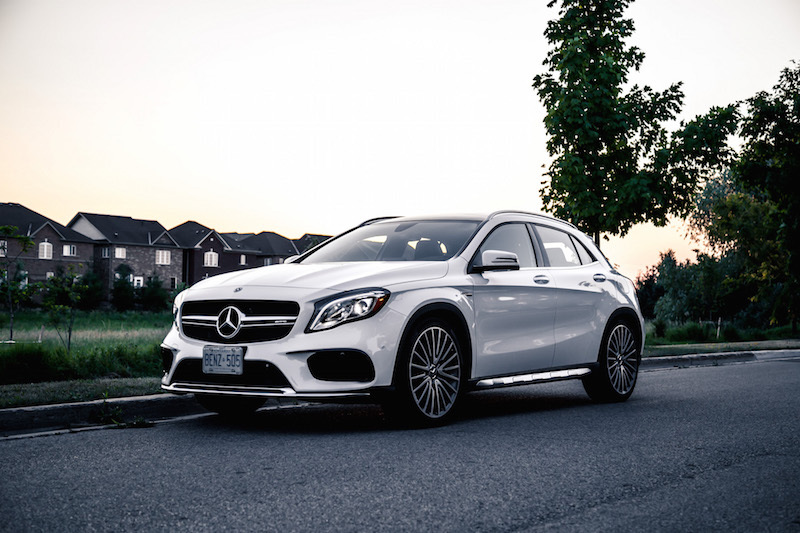 The GLA will bump, crash, and reverberate on the slightest of road imperfections, so do not expect a relaxing ride through town. Think BMW M2 levels of stiff, but not Civic Type R levels of ouch, and those optional 20-inch wheels don’t help much with ride quality either. But do not mistake stiff with uncomfortable. 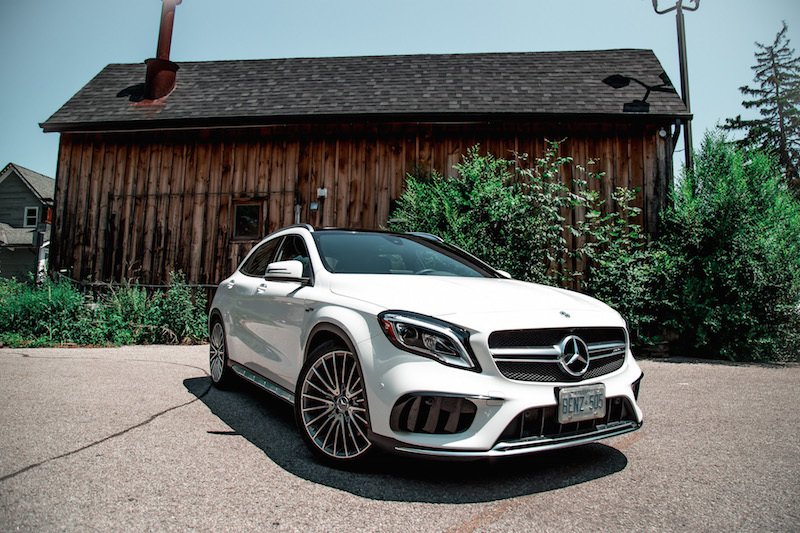 The GLA 45 and its small yet taut frame keeps body motions in check, and the chassis is incredibly rigid so you will always feel in control of all four wheels. 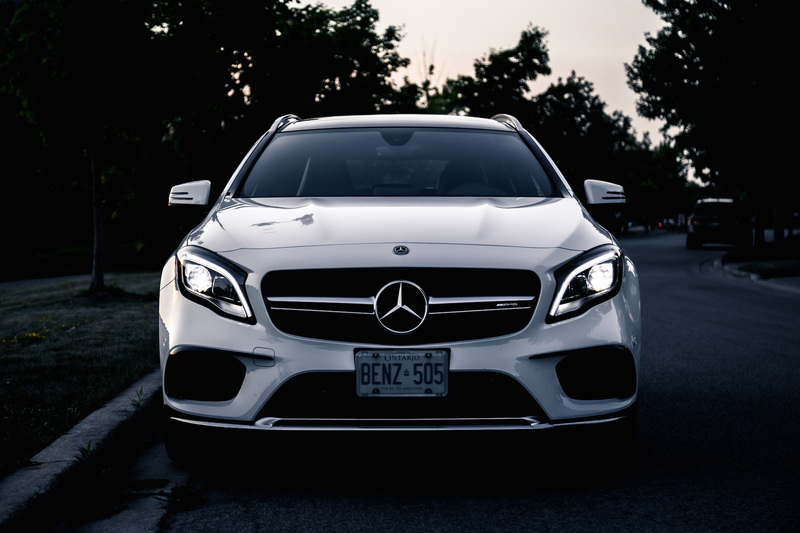 The center of gravity may not be as low as that in the CLA 45, but the nose is sharp, the grip is admirable, and it displays many moments of verve and vigour. 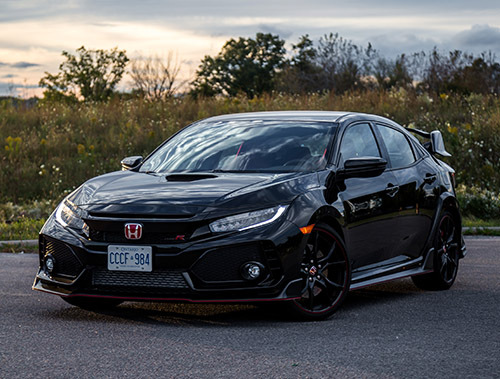 It is not as buttoned down as a Type R, or as squirrily in the backend as an M2, but it’s damned good fun. 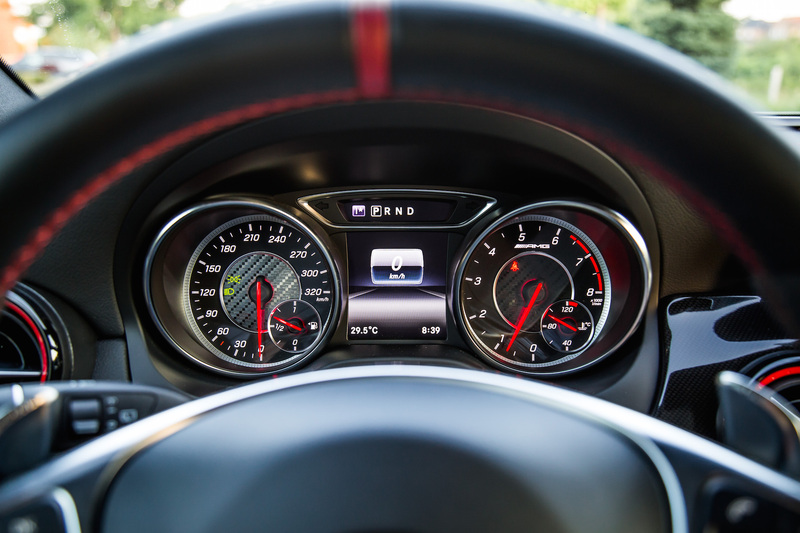 The GLA 45 offers many different driving modes to choose from, and drivers are able to tailor each setting at will, whether it be the powertrain, suspension, transmission, or stability control. 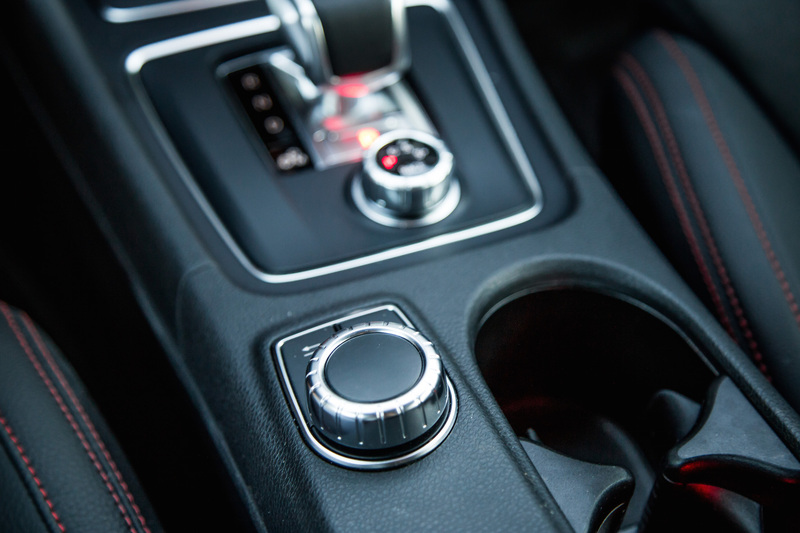 Via a dial on the center console, drivers can also choose from predetermined modes like RACE, Sport+, Sport, Comfort, or customize their own via Individual mode. 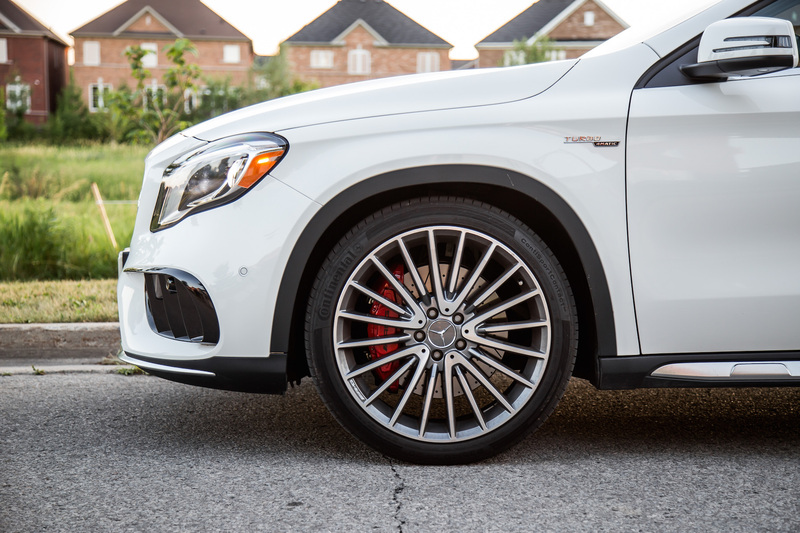 Track nuts can even opt for an AMG Track Package, which equips the GLA with a limited-slip front differential, deletion of the speed limiter (top speed now 270 km/h), a tire pressure monitoring system, and decks out the interior in full Alcantara. 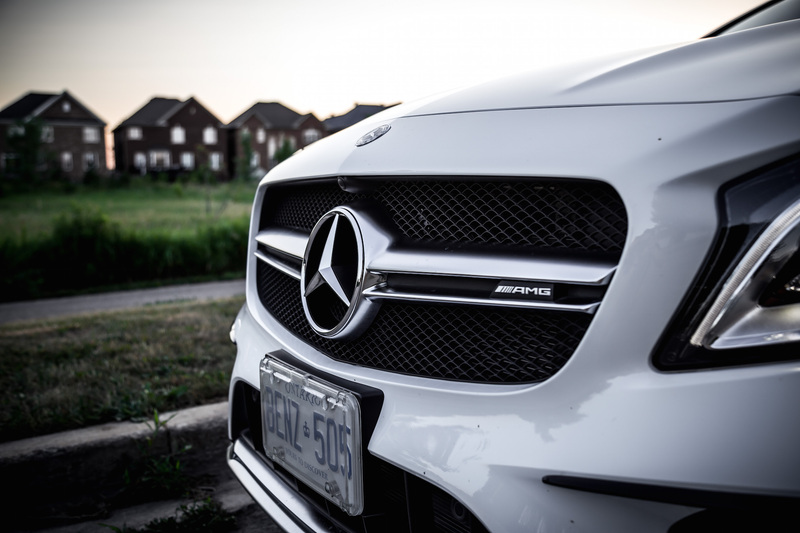 The GLA 45 competes in a heated segment brimming with potential and unique traits, including the Audi RS3, Volkswagen Golf R, and Honda Civic Type R. Though you should definitely take a look at the competition, what you should take away from this review is that the GLA 45 has the second best engine and exhaust (right behind the RS3), drives the second best (right behind the Type R), and looks the second best (subjective, but behind the mature Golf R). It may not be my number one in any of these categories, but it offers a jack of all trades compromise, one that does everything exceptionally well without any major sacrifice. 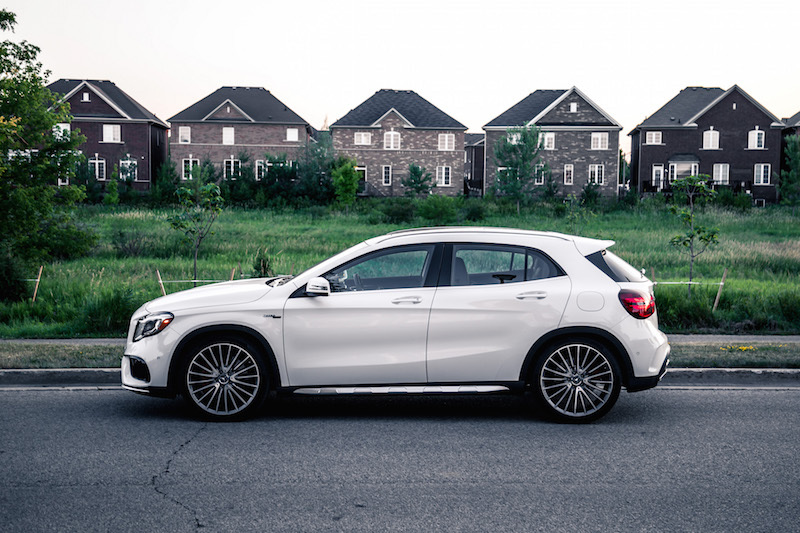 The GLA is a riot in a straight line, bonkers in the exhaust department, and has the visual anonymity to become a real sleeper. The GLA 45 may not be the definitive winner in any one category but as an overall sports hatch, it is a winner in its own right.